When I lived with my parents M&M’s had a constant presence in my house. My dad could not get enough of them, always tucking in before he sat down to watch a movie or straight after dinner. They were that sneaky chocolate treat that always left you wanting more. I’m not sure if I am happy or not that he passed on his love of this devilish treat, but nonetheless, my love of M&M’s is strong! As is my love of cheesecake. 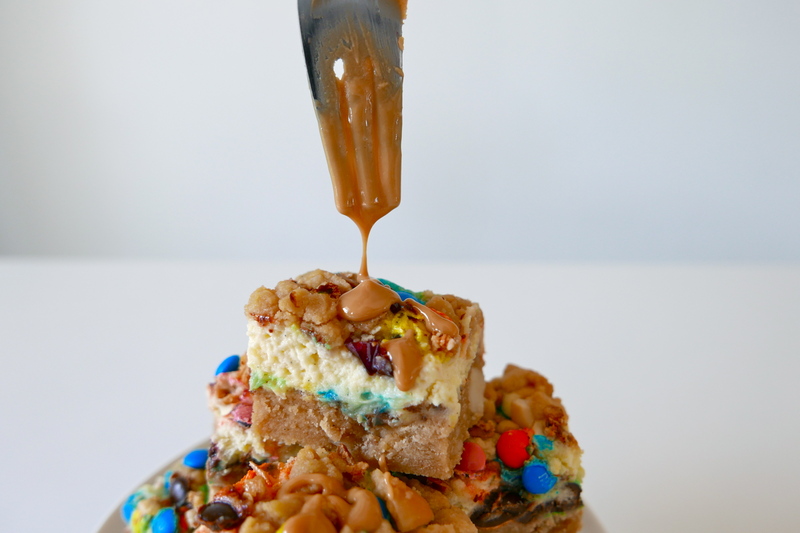 It is only fitting then to combine the two to make the ultimate M&M cheesecake slice. Two loves, one slice. 1. Preheat the oven to 180°C. Grease and line an 8 inch square cake tin. 2. Using an electric mixer (or KitchenAid), cream butter, vanilla and brown sugar together until fluffy. 3. Add flour and nuts and mix until combined. 4. Set aside 1/2 cup of the mixture and press the remaining mixture into the cake tin. 5. Bake for 15-20 mins or until slightly golden. 6. For the cheesecake: Add cream cheese, vanilla and icing sugar together and mix until well combined. 7. Add the egg and mix well. 8. Sprinkle half of the M&M’s over the biscuit base and pour the cheesecake mixture on top. 10. 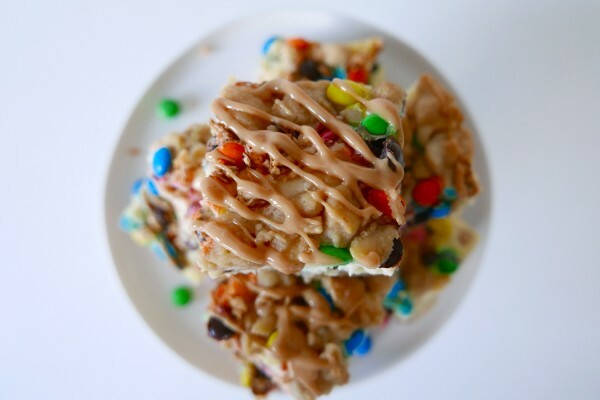 Drizzle the melted peanut butter over the slice and refrigerate for about 2 hours or until cold enough to cut and serve. The peanut butter adds just that little bit of savoury that this slice needs. Look at that glossy goodness! Adding muesli to the slice may seem a little strange but let me tell you, the added crunch and flavour is so mouthwatering you will be looking for ways to add muesli to all of your slices. And because it has muesli that means we can have a guilt-free piece for breakfast, right? 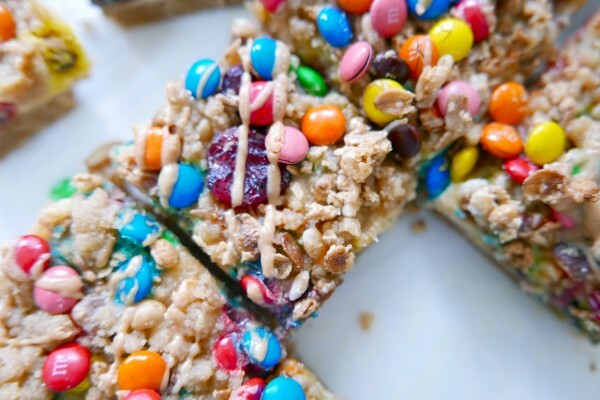 This slice is so versatile. 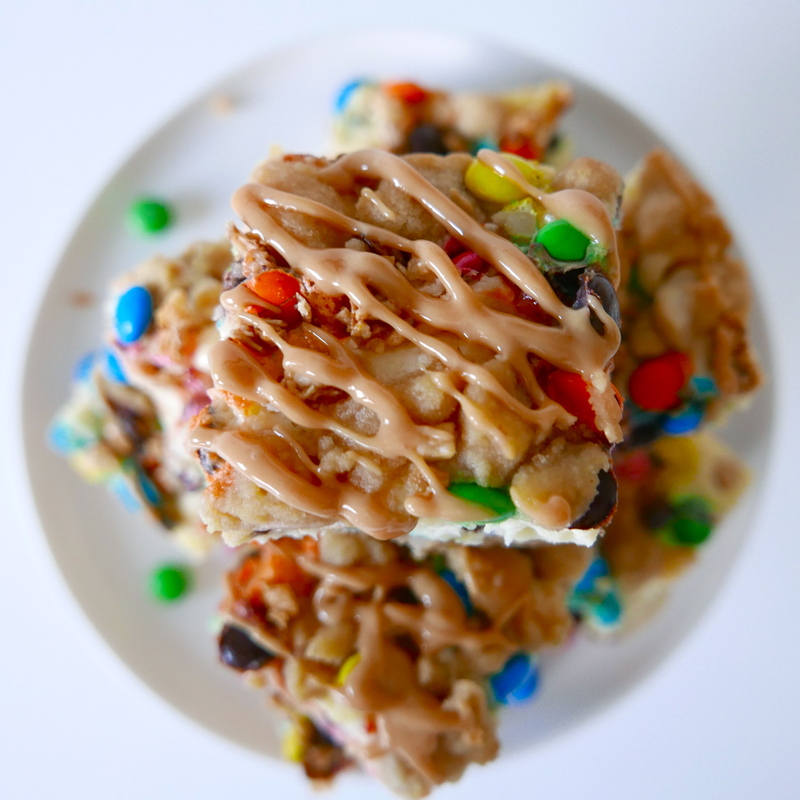 Swap the M&M’s for chocolate chips or nuts. 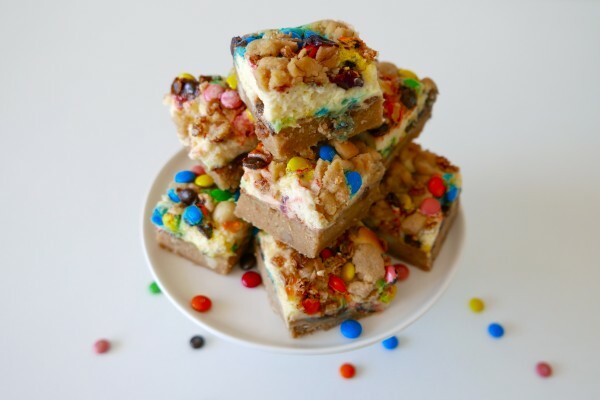 You could even chop your favourite chocolate bar up into pieces and sprinkle across. Don’t be afraid to make changes!